This paper is concerned primarily with the various Indian tribes who live, or have lived, in Manitoba and the West. It is not possible within space limitations to carry out as extensive a survey as one would like. However, it is hoped that the following will present a general picture of early population movements. From the time Indian migrations began out of Asia some 40,000 years ago,  most of our Indian population has been mobile. The movement of an agricultural village a short distance to fresh land; the hunting groups following buffalo or caribou herds; the hunter-fishermen moving to areas of seasonal abundance; and the need of gathering peoples to be in harvest areas. This restlessness, which was closely linked to the stage in development of Indian technology, is mirrored in the movements of the various tribes. This restlessness is clearly evident in the prairie provinces where hunting, fishing and gathering provided the only means of livelihood. The tribes which will be considered in detail in this paper are the Cree, Assiniboine, Ojibwa, Chipewyan, Dakota (Sioux), Blackfoot, Sarcees, Hidatsa and Gros Ventres. Other tribes such as Kutenais, Beaver, Shoshoni, Monsoni, Mandan, Iroquois and others will be mentioned but are not considered except briefly. The Cree Nation occupied an important role in the tribal migrations in Western Canada. Primarily a woodland peoples, they were forced to expand steadily because of the constant buildup of their numbers, and because of the nature of Cree land utilization, which required an extremely large area of forest and water to produce the needs of a family group. This they did in the prehistoric period in the woodlands from Labrador to Manitoba. That this expansion covered a considerable period of time is attested to by the dialetical differences which exist among the many bands who form the Cree. Cree penetration into Manitoba was reasonably early in the area between the present international boundary and the Nelson River in the woodlands. If we consider pottery remains, the time may be as long as nine hundred to fourteen hundred years. The Laurel Culture and particularly the Nutimik Phase which has been dated from approximately 500 to 1,000 A.D. by MacNeish,  could represent early Cree culture. 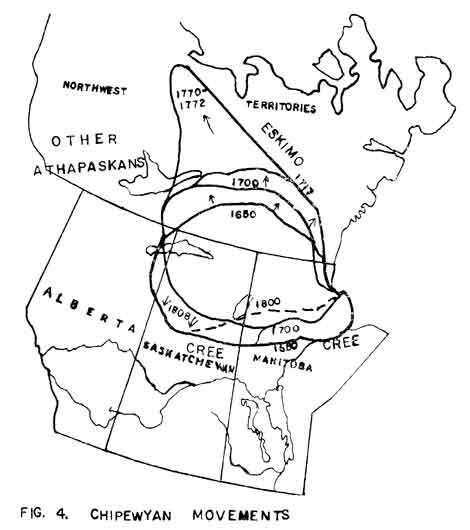 If we consider that this would take us back to the first known pottery influences reaching Manitoba, it is possible that the Cree were in part of Manitoba well before the idea of pottery reached this area. When we consider the breakaway of the Assiniboine from the Yanktonnai Dakota, and the alignment of the Assiniboine and the Cree, we have another bit of evidence for long Cree occupancy in Manitoba. 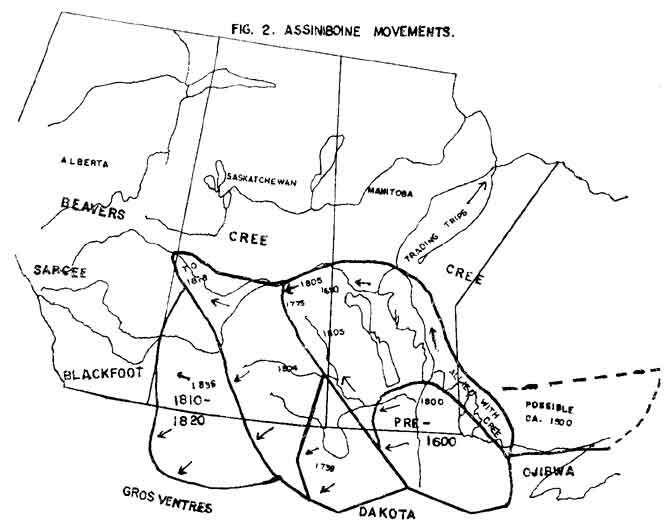 While some researchers consider the split of the Assiniboine from the Yanktonnai as occurring in the 17th century,  the archaeological evidence of longer Cree-Assiniboine alignment culturally would suggest that such a date is late. Jenness places this earlier when he says that the Assiniboine lived closest to the Iroquois in the seventeenth century and had probably separated off from the Dakota Sioux only a few generations before. It is obvious, too, from the close relationship between the Assiniboine and Cree through the historic period that the relationship had been a cordial one. The Assiniboine are considered by most archaeologists to have been responsible for the Black Duck or Manitoba Culture. The Assiniboine and the Cree were known to have been closely allied. Material from the Laurel Culture is found to varying degrees in various sites with that of the Black Duck (Manitoba) Culture. This was clearly evident at the Lockport Site where this situation had occurred over a number of centuries. It is, therefore, likely that the Laurel Culture represents early Cree Culture. The situation in this area was a fluid one. The Chipewyans had been moved north from the Nelson River-Churchill River portion of the coast. The Churchill River was, in general, the southern edge of the Chipewyan area before smallpox wiped out an estimated nine-tenths of this group in 1781. At this time, the Cree seem to have moved northward across the Churchill River in inland parts of present Manitoba and Saskatchewan. In the south, the Cree were first contacted in force July 14, 1732 near Fort St. Pierre, (present Fort Frances), when about two hundred assembled to meet La Verendrye. Two hundred Cree warriors centred at the Lake of the Woods made friendly overtures in late summer of the same year. Added to this was the information that sixty other warriors were at Lake Winnipeg. That there were a large number in the area is noted in June, 1733, when Cree warriors and three hundred Monsonis (part of the Ojibwa)  gathered at the Lake of the Woods in war paint, preparatory to a war party upon enemy Dakota and Ojibwa to the south and southeast. It is interesting to note that groups of the Ojibwa were enemies at this time. The Assiniboine and Cree were to use the Ojibwa later (1790) as buffer-allies against the pressures and war parties of the Dakota. These may have been the Monsoni, their old allies. On December 30, 1733, a meeting was held at Fort St. Charles by La Verendrye with seventy Assiniboine and Cree from Lake Winnipeg. This is one of the first of innumerable references which show the Cree and Assiniboine living or travelling together. Pond's experience at The Pas with Chief Chatique, without doubt a Cree, (Pelican Lake in Saskatchewan also is called by Alexander Mackenzie "Lake du Chitique"  shows some of the power and the attitude of these bands: "... (he) succeeded in forcing them to give presents to the extent of three casks of gunpowder, four bags of shot and ball, two bales of tobacco, three kegs of rum, and three guns together with knives, flints and some smaller articles." Moreover, he followed them up and levied another keg of rum. It is obvious that the toll charges at this point were considerable. There is a factor which reduces the effectiveness of the Cree at this time-smallpox. For the Cree in the woodlands an epidemic brought devastation in 1784. Jenness notes also that the Plains Cree were decimated in the eighteenth century. Whether both epidemics occurred at roughly the same time was not determined but is likely since the disease was sweeping the Indian tribes widely at this time. The pressure of the Cree in northwestern Saskatchewan was almost eliminated. The Chipewyan, themselves decimated by smallpox in 1781, moved south. Whereas Pond notes only Cree on his route through Ile a la Crosse and Portage la Loche on his way to establish a post on the Elk River in 1778, Alexander Mackenzie, in denoting the southern boundary of the Chipewyan in the period 1789-1793, lists these places as Chipewyan. Even a people decimated a few years before were able to displace the Cree at this time. The period from 1775 to 1820 is one of intensive contact with the Indian tribes, particularly through the fur trade, but also through colonization and plain curiosity. The battle between the fur companies grew in intensity leading to the merger in 1821. By 1817, the Cree had moved from Red River, their eastern boundary being near Portage la Prairie. From this point onwards, the Plains Cree moved westward. Hind says that, between 1835 and 1858, diseases and wars had reduced their numbers from about four thousand to one thousand and they became an ineffective group on the plains. In the woodlands, their numbers decreased, but not as markedly, and the area they maintained was fairly stable. From the archaeological evidence in prehistoric sites, there is no doubt about the long and widespread intermixture of Assiniboine and Cree. However, this relationship could have preceded considerably the known breakaway of the Assiniboine from the Yanktonnai Dakota. Jenness has suggested this to be the early seventeenth century minus a few generations. It is possible but highly unlikely that future archaeological research will throw much light on this problem. Our earliest historical reference to the Assiniboine is in the Jesuit Relations. The Assiniboine are placed at Lake Nipigon in 1637-38. Jenness places them around the Lake of the Woods and Lake Nipigon in the early 1600s. It was obvious from the Lockport excavation that Cree and Assiniboine affiliation was strong in the upper four levels with only slight evidence of Assiniboine in the fifth and sixth levels. These six levels covered the period of pottery-making at Lockport, a period of at least fifteen hundred years. The fourth level might indicate the original state of close co-operation between the two tribes. That this tribe extended over a considerable area in the latter half of the 17th century is obvious. However, by 1733, La Verendrye does not describe any Assiniboine living east of Lake Winnipeg, although in that year a party did travel to Fort St. Charles from Lake Winnipeg. On his westward trip he found them west of the Forks of the Red River. They were at Fort La Reine that year. The first villages were encountered on the third day out from Fort La Reine (possibly sixty to seventy-five miles out) and, some days later on their trip to the Missouri, they came to another Assiniboine camp but went twenty-two leagues out of their way. It was obvious that, while this group controlled much of the area to the Missouri, it wasn't without protest from some bands of the Dakota. To eliminate some confusion with the Chipewyan, and others, I will use the term Ojibwa. However, this nation has many names. Hilger says there are more than seventy different names for the group. We hear of them as Saulteurs, Saulteaux, Chippeways, Ojibwa, Ojebways, Monsonis, and Bungee to name some. Jenness includes also the Missisauga of Manitoulin Island, the Ottawas and the Potawatomi. Another closely related tribe, the Plains Ojibwa, are included in this group for brevity. Contact remains fairly constant with this group throughout their usefulness as a buffer group between the whites and the Indians farther west. This can be considered as a period from 1640 to 1830 or slightly later. 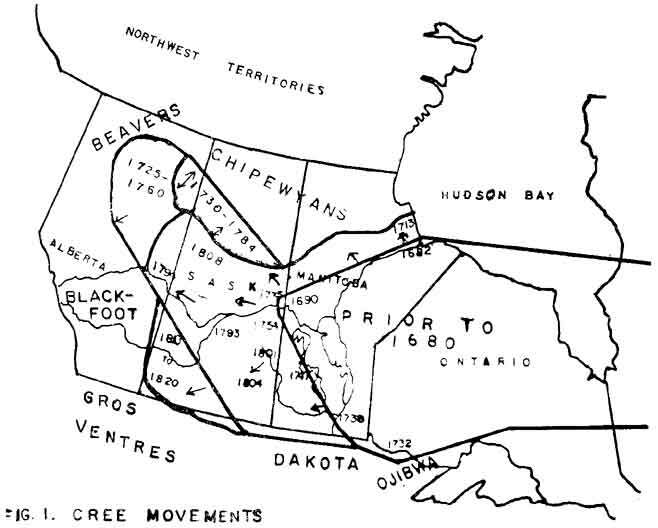 From at least 1790 until the 1860s, we find that the Ojibwa are being used as much as possible as a buffer group by the Assiniboines and Crees against the Dakotas. The efforts of the missionaries and the traders to curtail or eliminate inter-tribal warfare were necessary since people engaged in warfare cannot easily be evangelized or produce fur. Efforts to have the Ojibwa agree to the French peacemaking attempts failed because the Ojibwa said the Dakota were encroaching upon their trapping grounds. However, three years later in 1665, the Ojibwa in Grand Council agreed to peace. This would appear to be south of the present international boundary in Minnesota since the Monsoni (An Ojibwa group although enemies to a related group south of Lake Superior) were in command of the river route along the Pigeon and part of the Rainy River while their allies, the Cree, were in command of the Lake of the Woods area. Moore states that in June, 1733, La Verendrye was visited by three hundred warrior Monsonis and the next day by five hundred Cree, all wearing war paint. It is further stated that hereditary hatreds were nursed by the northern Indians (Cree, Assiniboine and Monsonis) against the southern tribes (the Dakota and Ojibwa). I find this a little difficult to understand. A. S. Morton identifies the Monsonis as Ojibwa. Would Ojibwa fight Ojibwa in the way the Assiniboine were fighting the Dakota? 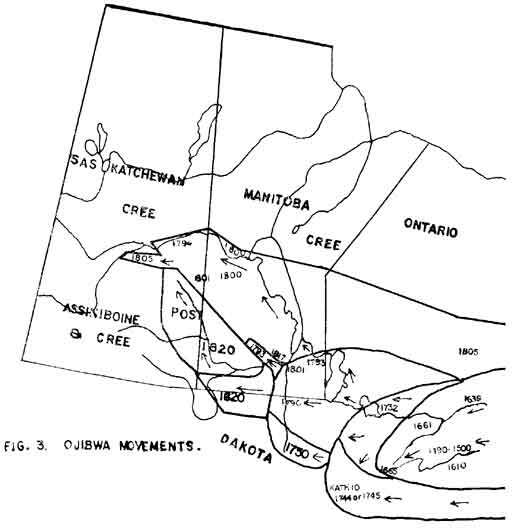 If so, the situation drastically changed shortly since all Ojibwa seemed to be allied with the Cree and Assiniboine. There is a possibility that Ojibwa were the enemies of the Monsoni.s. The Monsonis seem to disappear from the scene. Perhaps Alexander Henry, the younger, provides a key on August 19, 1800 when he tells of Indians arriving at the site of Fort Rouge. He says they are called the Snakes who formerly inhabited the Lake of the Woods. They once were numerous (the Monsoni were), but now cannot muster more than fifty men. They may be said to be of the same nation as the Cree but have a different dialect somewhat resembling the Saulteur (Ojibwa) language. They now lived upon the Assiniboine about thirty leagues west of the Forks. If these are the same group, we have an intriguing possibility for clarifying a chapter of history which mystifies me-where did the Monsoni go? If the Snakes are the Monsoni, this could be the answer. The Ojibwa called the Dakota "Nadewessis" which means Snakes or enemies. Is this the link? Possibly other sources can help to clarify this. But to return to La Verendrye. On August 29th, 1733, one hundred and fifty gaily coloured canoes arrived at Fort St. Charles each carrying three to five Cree or Monsonis. All the Monsoni are reported as escorting the supply canoes to Fort St. Charles in October, 1733 to trade. At Christmas, news came to La Verendrye that three hundred Monsoni at Fort St. Pierre were preparing for war. Beyond these, I found no other reference to the group. Mackenzie makes several mentions of the Ojibwa whom he calls the Algonquins. He allots the land east of the Red River to them and says they are considered natives of Lake Superior. He bolsters this when he talks of the country next to Lake Winnipeg and about its source which he states is the "station" of the Algonquins and Knisteneaux (Cree). The part of Lake Winnipeg meant must be the southern portion because in telling of the northern part of the lake he later says: "The inhabitants who are found along this lake are of the Knisteneaux (Cree) and Algonquin tribes, and but few in numbers ..."  About Lake Dauphin and the area north to the Saskatchewan River, Mackenzie says they are Cree from the north of Lake Winnipeg and Algonquins from the country between the Red River and Lake Superior. Duncan M'Gillivray, in 1794, found a few tents of Cree and Ojibwa at Nipiwin. M'Gillivray, also in 1794, reported Sotos (sic) between Nepawi (Nipawin) and Sturgeon River who had had a quarrel with the people of the lower department last fall. Both of these reports are from well west of where one would expect, from other historical evidence, to see Ojibwa. However, some groups have been found a considerable distance from where they could be expected. Even today, one Ojibwa group is somewhat removed from others. This is the band which has a reserve at Cochin, south of Meadow Lake, Saskatchewan. For possibly two centuries the Ojibwa played a buffer role, first for the French and later for their Cree and Assiniboine allies. That they were aided by French guns at the beginning cannot be denied. However, it would appear that their considerable numbers were especially important once their original buffer role was finished. The first evidence of non-Europeans reported directly for northern Manitoba would appear to be at Churchill where Jens Munk wintered in 1619-20. "... There was no trade with natives, for though traces of their wanderings were clear, none appeared during Munk's stay." Whether these traces were Chipewyan, Eskimo or other groups we do not know. There is insufficient evidence to differentiate between Chipewyan or Cree but the evidence does point towards Indian rather than Eskimo. From this reference, I am inclined to believe that the Indians responsible were Cree from the mention of sweat houses, but our information on Chipewyan is poor so that it is unwise to come to a definite decision. In 1781, smallpox devastated the Chipewyans, Hearne estimating that nine-tenths of the group perished. Because of the resurgence of the Chipewyan in 1784 in the Ile a la Crosse area in Saskatchewan pushing back the Cree, it is likely that the Chipewyans close to Churchill were badly hit in the 1781 epidemic. This, coupled with the inroads of Montreal traders with the Chipewyans farther west, gave the impression that the Chipewyans had almost died out. The Dakota are a group who have had a steady influence on the Indian groups in Manitoba while occupying little of the province at any time. The term Dakota is used in this paper as it is more accurate than the term Sioux. The Assiniboine are also a Siouan group as are the Crow, Hidatsa and others. However, the Dakota is used to denote those groups of the Dakota who lived in Minnesota, and the Dakotas during the period under discussion. The following year, the Dakota signed a treaty with the French. In that year, 1662, the Ojibwa refused to make peace with the Dakota who "are encroaching on their trapping grounds." Three years later in 1665, the Ojibwa in Grand Council decided to make peace with the Dakota. Father Allouez, the same year, met the Dakota at the west end of Lake Superior. In 1670, because of trouble with the Dakota, the French retire from the Upper Lakes. However, by 1695, Pierre La Sueur had a trading post in Minnesota amongst the Dakota,  probably in the Mille Lacs area. The later history of the Dakota is one which is recorded ably in many sources. 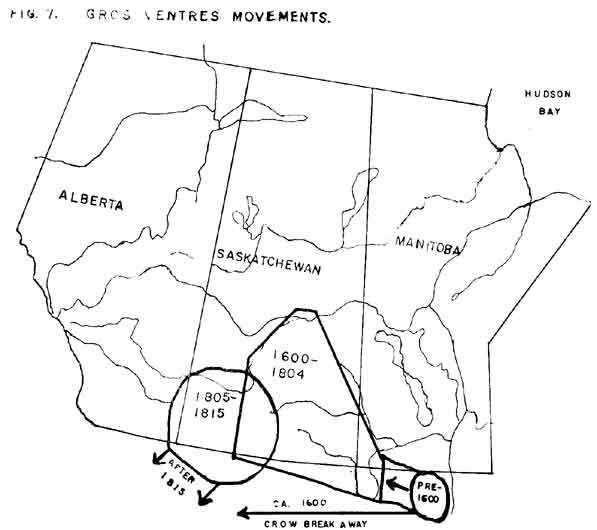 The effect on movements in Manitoba and the West become less important as colonization advanced. 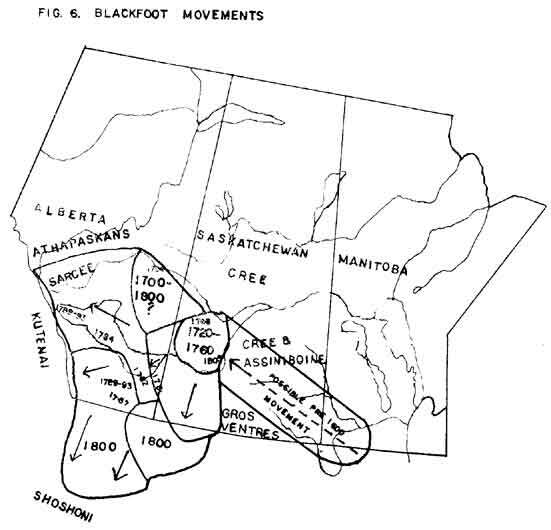 Our lack of knowledge of the earliest periods makes it difficult to consider the role of the Blackfoot on the prairies. It is possible that as the Cree moved westward from Manitoba, after they obtained guns from the Hudson's Bay Company, starting in 1682, they were displacing Blackfoot. One of the stories which I have heard from members of the Feter Ballantyne Band of the Cree  has been of a Cree-Blackfoot battle near Pelican Narrows in Northeastern Saskatchewan. However, this accounts for the doubtful area in east-central Saskatchewan marked on Figure 7. The dating of 1650-1700 would be likely as this would include the initial acquisition of guns by the Cree, and their occupancy of this area. The acquisition of firearms permitted the Cree to move quickly westward displacing Athapaskan groups who were forced northward and the Blackfoot who were forced southwestward, This brought the Blackfoot in direct conflict with the Shoshoni (Snakes) who were moving steadily northward. The horses of the Shoshoni were a distinct advantage in the initial stages of the struggle. The Blackfoot soon acquired firearms from the northeast and then horses, probably in trade with the Flathead, Kutenai, Nez Perce or Gros Ventres. They then pushed the Shoshoni south and west. They pushed the Flathead and Kutenai off the plains and into the Rockies. In addition, their former hostility to Cree and Assiniboine continued and later extended to their former allies, the Gros Ventres. From early in the eighteenth century until almost the end of the nineteenth century, the Blackfoot were continually at war with their neighbours. One of the groups who were steadily identified with the Blackfoot, although of a different linguistic group, were the Sarcees. Hewes feels that they are late as far as occupation of the prairies is concerned, probably late 18th century. It is possible, however, that this is one of the groups who were left en route during the southward movement of the Navaho-Apache, and that they have been on the prairies for some centuries. The Sarcees were not numerous. Mackenzie places them (1789-1793) "at the Southern Head-waters of the North-branch" (of the Saskatchewan River) consisting of about thirty-five or one hundred and twenty men. It is likely that the group were a buffer for the Blackfoot with the Athapaskans to the north and northwest. That they acted successfully as such is probably due to the small concentrations and poor organization of the other Athapaskans in the adjacent areas. The alliance of the Blackfoot and Sarcees continued until the reservation period when such alliances lost their dynamic meaning. The Gros Ventres tribe played an important part in the history of Saskatchewan, a role which is being re-discovered gradually. This Algonkian group originally were part of the Northern Arapaho tribe who once lived in the Red River Valley probably as far north as the present-day international boundary. They were once a sedentary, agricultural people. In determining the movements of this group, one notes a confusion in early records. This is because of another group, the Hidatsa, who were also called Gros Ventres. Both have occupied parts of the northeast quarter of North Dakota, and in many respects, their migration routes have been close enough at times to cause confusion. That they were also in Saskatchewan is another confusing factor. The possibility that the Arapaho-Atsina occupied the Red River Valley north of Grand Forks is an intriguing one, suggesting that evidence for this hypothesis should be available in sites along the Red River in Canada also. However, little, if any work, has been done along the Red River between Winnipeg and Grand Forks: work which is necessary if this possibility is to be explored. It is likely that the group reported by Hendry in 1754 were Gros Ventres. For 1789-1793 Mackenzie notes: "The Assiniboine, and some of the Fall, or Big-bellied Indians, are the principal inhabitants of this country, and border on the river occupying the centre part of it." This refers to the area of southern Saskatchewan between the South Saskatchewan, Qu'Appelle and Assiniboine Rivers, and the Missouri. It is likely that he is writing about the Gros Ventres of the Plains (Atsina). With Thompson and Umfreville, there seems to be a good possibility that they have some confusion between the two groups who were called the Gros Ventres. There is some indication that they are also including the Hidatsa, although this might not be the case. The following year (April 28, 1806), he reports a Gros Ventres raid on an Assiniboine camp fifteen miles from South Branch Fort in which several Assiniboine were killed. This seems to be a final thrust of the Gros Ventres who were soon out of the area. The group, ironically, were to be placed later on a reserve with the Assiniboine at Fort Belknap, Montana. While there is some reference to guttural-speaking Indians (and Hidatsa were of guttural Siouan language stock), there is obviously confusion between the Gros Ventres of the Plains (Atsina) and the Gros Ventres (Hidatsa). As I have mentioned previously, it is likely that both David Thompson and Umfreville, amongst others, confused the two groups because all other evidence is contrary to the possibility that the Hidatsa occupied much of Saskatchewan. Outside of the Long Creek Site, no other sites have been recognized in Saskatchewan as Hidatsa; something which could be expected if the Hidatsa had ranged so widely for over two centuries. This takes into account the limited archaeological work which has been done in Saskatchewan. With the present information which we have, I do not think we can assume that the Hidatsa did any more than touch the edge of present Canadian territory and then, probably, for very short periods. Harmon records the Beaver Indians coming in "great numbers" to trade at Fort Vermilion on the Peace River. He notes other groups of Beavers at Encampment Island Fort and Dunvegan farther up the river. These references are noted in October, 1808. At the same time, he notes Iroquois in the area occupied by the Beavers at Fort Vermilion and Dunvegan. These eastern Canadian Indians had come into the area originally in the employ of the fur companies and Harmon notes them in both instances as hunters. The problem of further defining the Indian migrations in Manitoba and the West is one upon which a great deal of work is required. The primary resource, other than additional sources which can be found among fur trade records, must be the untold archaeological sites which have been located and which should be excavated. The archaeological possibilities are ones which must be fully exploited if the picture is to emerge from the present state of partial confusion. It is hoped that the foregoing will provide some broad guidelines in the total picture. I am indebted to Miss Mary Romaniuk for the typing of the final draft of this manuscript. 1. Wilson W. Crook, Jr. and R. K. Harris, "A Pleistocene Campsite near Lewisville, Texas". American Antiquity. n.s., Vol. XXIII, No. 3, Jan. 1958, pp. 233-242. 2. R. S. MacNeish, "An introduction to the Archaeology of Southeast Manitoba" (Ottawa, 1958), National Museum of Canada, Bulletin 157, p. 55. 3. G. Laviolette. The Sioux Indians in Canada (Regina, 1944), p. 12. 4. D. Jenness, The Indians of Canada (Ottawa, 1932, 4th Edition 1958), National Museum of Canada, Bulletin 65, Anthropological Series No. 15, p. 308. 5. W. M. Hlady, "The Ceramic Sequence at the Lockport Site and Its Bearing on North American Archaeology," m.s. on file at the University of North Dakota, 1950, pp. 1-13. 6. MacNeish, op. cit., p. 55. 7. W. L. Morton, Manitoba - A History (Toronto, 1957), p. 13. 8. A. G. Doughty and C. Martin, The Kelsey Papers (Ottawa, 1929), p. xxxvii-xxxviii. 9. V. F. Kenney (Editor), The Founding of Churchill (Being the Journal of Captain James Knight) (Toronto, 1932), p. 52. 10. Kenney, op. cit., p. 56. 11. Kenney, op. cit., p. 56. 12. Kenney, op. cit., p. 59. 13. Samuel Hearne, A Journey from Prince of Wales’ Fort in Hudson's Bay to the Northern Ocean (Toronto, 1958), Edited by R. Glover, p. 115 ff. 14. I. Moore, Valiant La Verendrye (Quebec, 1927), p. 133. 16. A. S. Morton, A History of the Canadian West to 1870-1871 (Toronto, 1939), p. 11. 17. Moore, op. cit., p. 154. 18. A. C. Garrioch, The Correction Line (Winnipeg, 1933), pp. 109-110. 19. Moore, op. cit., p. 164. 23. E. Coues (Editor), The Manuscript Journals of Alexander Henry and of David Thompson 1799-1814 (New York, 1897), Vol. 1, p. 41. 24. J. MacGregor, Behold the Shining Mountains (Edmonton, 1954), p. 48. 25. H. A. Innis, Peter Pond (Toronto, 1930), p. 69. 26. C. Vickers, "Aboriginal Backgrounds in Southern Manitoba", Historical and Scientific Society of Manitoba (Winnipeg, 1946), Season 1945-46, p. 3. 27. Garrioch, op. cit., p. 109. 28. Alexander Mackenzie, Voyages front Montreal Through the Continent of North America (Toronto, 1911), Vol. 1, p. cxvii. 29. Innis, op. cit., p. 71. 31. Jenness, op. cit., p. 385. 34. Mackenzie, op. cit., Vol. 1, p. clxxi. 35. Duncan M'Gillivray, The Journal of Duncan M'Gillivray (1794-5), Edited by A. S. Morton, (Toronto, 1929), p. 62. 37. NE ¼, Sec. 24, T. 56, R. 6 West of the 4th Meridian. 38. M'Gillivray, op. cit., p. 29. 45. Ibid., pp. 74, 75. 46. F. G. Roe, The Indian and the Horse (Norman, 1955), p. 209. 47. Mackenzie, op. cit., p. cxl. 55. Coues, op. cit., p. 43. 56. Coues, op. cit., Vol. 1, p. 46. It is likely this group are now known as Plains Ojibwa. 57. W. M. Hlady, "The Archaeology of the Red River of the North and the Whiteshell River Areas." Proceedings of the Fifth Plains Conference for Archaeology, (Lincoln, 1949), p. 94. Also W. M. Hlady, "Manitoba Archaeology," Manitoba Arts Review, Vol. VIII, No. 1, (Winnipeg, 1952) pp. 25, 32. 58. Vickers, op. cit., pp. 3-4. 59. Daniel Williams Harmon, A Journal of Voyages and Travels in the Interior of North America (Toronto, 1904), p. 24. 60. Ibid., pp. 34, 35, 51, 55-6, 69-70, 88, 99, 104. 68. Ibid., pp. 136, 139. 69. Vickers, op. cit., p. 3. 70. H. Y. Hind, Northwest Territory, Reports of Progress (Toronto, 1859), p. 46. 71. Jenness, op. cit., p. 308. 72. Vickers, op. cit., p. 4. 73. MacNeish, op. cit., p. 79. 76. R. G. Thwaites (Editor) Jesuit Relations and Allied Documents (Cleveland, 1897), Vol. 54, p. 193. 77. Jenness, op. cit., p. 308. 78. Hlady, "Ceramic Sequence" pp. 1-13. 79. A. S. Morton, op. cit., pp. 112-113. 80. Moore, op. cit., pp. 148, 164. 81. Vickers, op. cit., p. 4. 82. Moore, op. cit., p. 275. 83. Ibid., pp. 275, 282. 84. Doughty and Martin, op. cit., p. xxxvii. 85. MacGregor, op. cit., p. 44. 86. A. S. Morton, op. cit., pp. 237-8. 87. MacGregor, op. cit., p. 48. 88. Mackenzie, op. cit., p. cx. 91. Cited by Vickers, op. cit., pp. 4-5. 92. M'Gillivray, op. cit., p. 27. 96. Ibid., pp. 27, 34, 35, 50. 97. Cited by Vickers, op. cit., p. 6. 98. Coues, op cit., p. 43. 99. Vickers, op. cit., p. 3. 100. Harmon, op. cit., p. 34. 106. M. Lewis and W. Clark, History of the Expedition under the command of Captains Lewis and Clark (Philadelphia, 1814), Vol. 1, pp. 191-192. 107. David I. Bushnell, Jr., Burials of the Algonquian, Siouan and Caddoan Tribes West of the Mississippi, Bureau of American Ethnology, Bulletin 83 Washington, 1927), p. 44. 108. Harmon, op. cit., p. 104. 114. Rev. John West, The Substance of a Journal During a Residence at the Red River Colony (London, 1827), p. 33. 115. Maximilian, Prince of Wied, Travels in the Interior of North America (London, 1843), p. 205. 116. LaViolette, op. cit., p. 26. 117. Jenness, op. cit., p. 316. 118. Sister M. Inez Hilger, Chippewa Child Life and Its Cultural Background, Bureau of American Ethnology, Bulletin 146 (Washington, 1951), p. 2. 120. Jesuit Relations and Allied Documents, Vol. 23, p. 225; Vol. 54, p. 193. 121. LaViolette, op. cit., p. 19. 123. Moore, op. cit., p. 154. 124. A. S. Morton, op. cit., p. 11. 125. Coues, op. cit. Vol. 1, p. 146. 126. Moore, op. cit., p. 160. 129. Scudder McKeel, "A Short History of the Teton-Dakota," North Dakota Historical Quarterly, Vol. x No. 3 (Bismarck, 1945), p. 151. 130. Duncan W. Strong, "From History to Prehistory in the Northern Great Plains," Smithsonian Miscellaneous Collections, Vol. 100, (Washington, 1940), p. 370. 131. Garrioch, op. cit., pp. 109-110. 132. Cited by Vickers, op. cit., p. 3. 133. Mackenzie, op. cit., p. ci. 137. M'Gillivray, op. cit., p. 20. 138. Coues, op. cit. Vol 1, p. 7. 140. Harmon, op. cit., p. 11. 150. Vickers, op. cit., p. 3. 151. 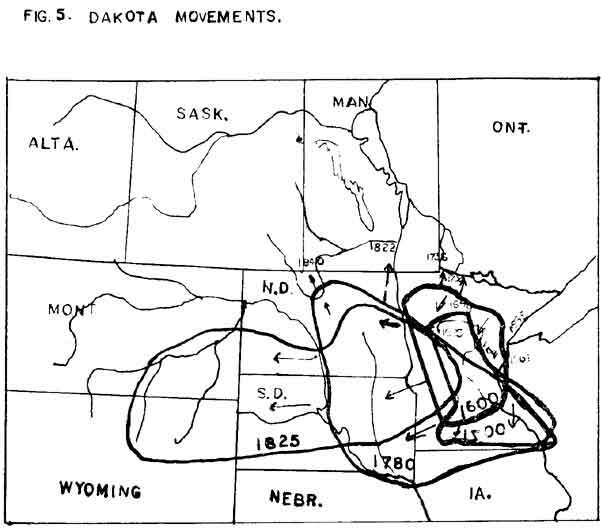 Gordon W. Hewes, "Early Tribal Migrations in the Northern Great Plains", Plains Archaeological Conference Newsletter, Vol. 1, No. 4, Lincoln, pp. 3-12, 1948. 152. Rev. Peter Jones, History of the Ojibway Indians (London, 1861), p. 129. 153. Hewes, op. cit., p. 7. 154. W. L. Morton, op. cit., p. 5, citing, C. C. A. Gosch, Danish Arctic Expeditions 1605-1620, Hakluyt Society, (London. 1897), Vol. II, p. 23. 155. Luke Fox, North-west Fox or Fox from the North-west Passage (London, 1635), p. 216. 156. Grace Lee Nute, Caesars of the Wilderness (New York, 1943), pp. 291-2. Appendix 2 being "Extract of Mr. Thomas Gorst's Journal in the Voyage to Hudson's Bay begun the 31th (sic) day of May 1670." 157. Kenney, op. cit., pp. 52, 59. 158. Jenness, op. cit., p. 385. 160. Kenney, op. cit., p. 56. 161. Jenness, op. cit., p. 385. 162. Innis, op. cit., p. 80. 164. Hearne, op. cit., p. 115 ff. 165. Mackenzie, op. cit., p. clxxi. 167. Harmon, op. cit., p. 136. 168. Innis, op. cit., p. 80. 169. Harmon, op. cit., p. 137. 170. Innis, op. cit., p. 80. 171. Harmon, op. cit., p. 139. 172. K. Birket-Smith, Contributions to Chipewyan Ethnology, Report of the Fifth Thule Expedition (Copenhagen, 1930), p. 34. 173. West, op. cit., pp. 165-6. 174. T. Simpson, Narrative of the Discoveries on the North Coast of America (London, 1843), p. 71. 175. M. J. E. A. Gasté, "Father Gasté Meets the Inland Eskimo", (A letter from Father Gasté to his superior, Bishop Grandin, July 15, 1869), Eskimo (Churchill, 1960), Vol. 57, pp. 3-15. 176. LaViolette, op. cit., p. 18. 186. Moore, op. cit., p. 154. 187. LaViolette, op. cit., p. 20. 188. McKeel, op. cit., p. 151 after W. W. Warren, "History of the Ojibways, based upon Traditions and Oral Statements", Minnesota Historical Society Collections (St. Paul, 1885), pp. 190-3. 189. Bushnell, op. cit., pp. 29-30. 190. LaViolette, op. cit., p. 25. 191. Wm. H. Keating, Narrative of an Expedition to the Source of St. Peter's River, Lake Winnepeek, Lake of the Woods, etc., ... Under the Command of Stephen H. Long, Major, U.S.T.E., Vol. II, (Philadelphia, 1824). 192. LaViolette, op. cit., p. 25. 193. Cited by Bushnell, op. cit., 1927, p. 30. 194. Maxmilian, Prince of Wied, op. cit., pp. 147-8. 195. Harmon, op. cit., p. 132. 196. LaViolette, op. cit., p. 25. 199. Hewes, op. cit., 1948, p. 5. 200. B. Wettlaufer (compiler) and W. J. Mayer-Oakes (editor), The Long Creek Site, Saskatchewan Museum of Natural History, (Regina, 1960), p. 114. 201. Hewes, op. cit., p. 5. 202. The Peter Ballantyne Band can be located at Southend (Reindeer Lake), Two Rivers, Pelican Narows, Sandy Bay, Beaver Lake and Sturgeon Landing, all in Saskatchewan. 203. John C. Ewers, The Horse in Blackfoot Indian Culture. Bureau of American Ethnology, Bulletin 159, (Washington, 1955), p. 10. 205. Ewers, op. cit., p. 23. 207. Mackenzie, op. cit., p. cxi. 209. M'Gillivray. op. cit., p. 32. 218. Harmon, op. cit., p. 99. 222. Ewers, op. cit., p. 174. 223. Hewes, op. cit., p. 7. 224. Mackenzie, op. cit., p. cx. 225. M'Gillivray, op. cit., pp. 37, 40, 74-75. 226. Mackenzie, op. cit., p. cx. 227. T. Michelson, "Preliminary Report on the Linguistic Classification of Algonquin Tribes," Bureau of American Ethnology, Annual Report No. 28, 1906-1907 (Washington, 1911), pp. 221-290. 228. Hewes, op. cit., Figures IA, IB, and II., pp. 10-11. 229. Ibid., Figure IV, p. 11. 231. Jenness, op. cit., p. 326. 232. Anthony Hendry, York Factory to the Blackfoot Country. The Journal of Anthony Hendry, 1754-55, (Edited by L. J. Burpee), Transactions of the Royal Society of Canada, Series 3, Vol. 1, Section 2 (Ottawa, 1907). pp. 307-54. 233. Mathew Cocking, An Adventurer from Hudson Bay. Journal of Mathew Cocking from York Factory to the Blackfeet Country, Transactions of the Royal Society of Canada, Series 3 (Ottawa, 1908), Vol. 2, pp. 110-1. 234. Mackenzie, op. cit., p. ciii. 235. Harmon, op. cit., p. 117. 236. E. Umfreville, The Present State of Hudson's Bay, 1790 (London, 1790), n. 197. 237. Mackenzie, op. cit., p. cxi. 238. M'Gillivray, op. cit., p. 62. 241. D. Thompson, David Thompson's Narrative of His Explorations in Western America, 1784-1812. Champlain Society, (Toronto, 1916), pp. 239-240. 242. Harmon, op. cit., pp. 51-52. 247. Hewes, op. cit., pp. 4, 10-11. 248. A. W. Bowers, A History of the Mandan and Hidatsa, Ph.D. Dissertation, University of Chicago, (Chicago, 1948), p. 18, cited by Wettlaufer, op. cit., p. 106. 249. Wettlaufer, op. cit., p. 114. 250. Wettlaufer, op. cit., p. 107. 251. O. G. Libby, Introduction to "La Verendrye Journal 1738-1739", North Dakota Historical Quarterly, Vol. 8, No. 4, (Bismarck, 1941), p. 232. 252. Vickers, op. cit., p. 6. 253. M'Gillivray, op. cit., p. 56. 254. Harmon, op. cit., p. 141. 255. Ibid., pp. 141, 142. 256. Ibid., pp. 141, 142.